Rough rocks transformed into smooth, shiny, colorful works of natural art! 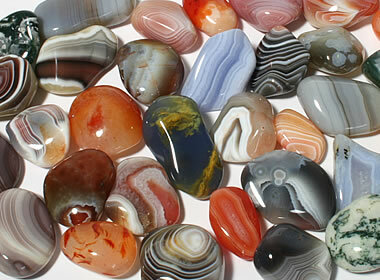 Tumbled agate: Agate is a popular rock used to make tumbled stones. There are many different types of agate. In this photo you can see Botswana agate, apricot agate, carnelian agate, tree agate, blue lace agate, dendritic blue agate, green moss agate and others. Many people enjoy tumbled stones because they are beautiful natural materials that have been given a pleasing shape and a bright polish. They are popular in jewelry, craft, souvenir, awards, collectibles, and New Age markets. Tumbled stones can be purchased by the pound at prices that just about everyone can afford. Their colorful appearance and interesting shapes have inspired many people to learn more about rocks, minerals, and gems. Tumbled jasper: Jasper is another type of rock that is a favorite of people who tumble stones. 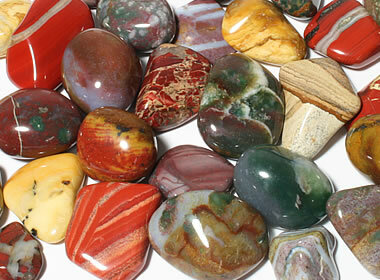 Shown in this photo are red jasper, brecciated jasper, picture jasper, yellow jasper, and more. What Materials Are Used to Make Tumbled Stones? The most popular materials used for making tumbled stones are attractive and colorful rocks and minerals that have a Mohs hardness between 5 and 8. These materials are generally durable and accept a good polish. Some of the most commonly tumbled materials are listed below. Crystalline quartz: Quartz varieties are great for making colorful tumbled stones. 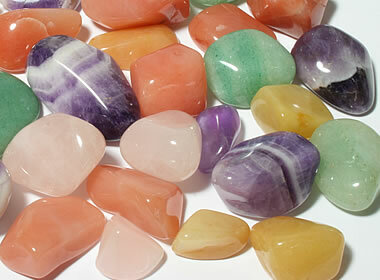 Shown here are rose quartz, orange quartz, yellow quartz, green aventurine, and amethyst. Tumbled eye agate: Some pieces of agate display concentric circles known as "eyes." These round markings are actually small hemispheres within the outer husk of the agate nodule. Most pieces of agate do not have "eyes," so stones that do have them are especially prized by collectors. Natural glasses: Obsidian is a natural glass formed during an eruption of silica-rich magma. 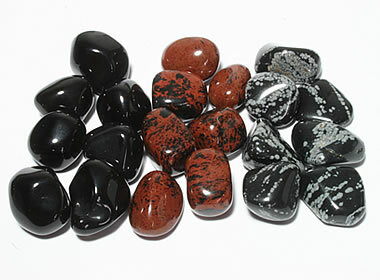 Shown here are Apache tears, mahogany obsidian, and snowflake obsidian. Tumbled igneous and metamorphic rocks: Some rocks will take a nice polish. Shown here are granite, basalt, gabbro, gneiss, and other types of rock collected from Ohio River sediments and sold as landscape stone. Petrified wood: Pieces of petrified wood can be tumble-polished to reveal wood grain and interesting patterns. Hobbyist Rock Tumbler: The machine above is a Thumler's Model B rock tumbler. It is one of the better hobbyist grade tumblers, and it tumbles about ten pounds of rock. It has a metal barrel with a rubber liner. Many Model B rock tumblers have been in reliable use for decades. Common opal: Pictured here several varieties of common opal that include pink opal from Peru, yellow opal and dendritic opal from Nevada, and olive opal from Kenya. How Are Tumbled Stones Made? 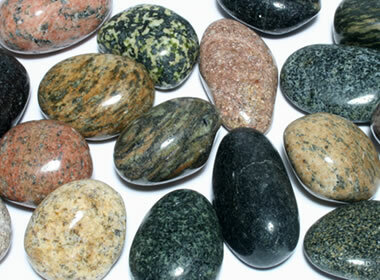 Tumbled stones are made in a machine known as a rock tumbler. The most commonly used rock tumbler is a rotary machine that turns a barrel containing the stones, along with abrasive grit, and water, for days and weeks at a time. As the rocks tumble in the barrel, the grains of abrasive grit get caught between the rocks and abrade off sharp points and edges. This first step modifies the shape of the rocks and moves them towards a rounded shape. In two subsequent steps, smaller-size granules of silicon carbide are used to smooth the surfaces of the rocks in preparation for polishing. Then, in the final step, a rock polish such as micron-size aluminum oxide is used to produce a bright, lustrous, polished surface on the rocks. The tumbling process usually takes a few weeks to complete in a rotary tumbler. Many people purchase rock tumblers to make tumbled stones as a hobby. Their tumblers range from inexpensive plastic machines that are usually loud and produce poorly-polished stones, to more durable metal machines with rubber barrels that are used by hobbyists. These machines usually tumble a few ounces to a few pounds of rock. Commercial machines, used by companies who produce tumbled stones as a business, are large enough to tumble up to two or three tons of rock at a time. These companies purchase their rough rocks and supplies by the ton and are able to produce tumbled stones at low enough prices that they can be sold at retail for lower prices than the hobbyist can ever compete with. For that reason, people who want tumbled stones are usually best served by purchasing them rather than trying to buy the rocks and supplies that they need and producing them in a small tumbler. However, many people enjoy producing tumbled stones as a hobby, and some of them are fortunate enough that they live or travel in areas where they can collect the rocks that they tumble instead of buying them. Uses of Tumbled Stones: Shown above are some of the many uses for tumbled stones. How Are Tumbled Stones Used? Tumbled stones are used for a wide variety of purposes. Each year a few thousand tons of tumbled stones are produced at commercial tumbling facilities, located in several different countries. They are then sold individually or by the pound or used to produce jewelry or items of decor. Depending upon the size of the stones and the material from which they are made, these stones are sold in the United States for prices that typically range from 50 cents per stone to $100 per pound. The most common types of stones sell for $10 to $20 per pound. Rock collections: Many people enjoy collecting interesting rocks. 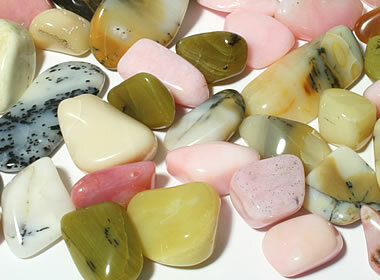 Tumbled stones are an easy and inexpensive way to start a colorful gemstone collection. Crafts: Tumbled stones can be used for an infinite number of craft projects! Jewelry: With some jewelry findings and a little glue, tumbled stones can easily be made into wearable art, including pendants, charms, earrings, tie tacks, cufflinks, keychains and more. Wire-wrapping is also a popular method for making pendants, charms, and other one-of-a-kind handmade jewelry items. Gifts: Brightly polished stones make great gifts, and they can also be used as embellishments on wrapped packages. Prizes & Rewards: Teachers and parents can encourage children to do their best by offering prizes and rewards for good grades and good behavior. Games: Have a sandbox treasure hunt, play tic-tac-toe, or use tumbled stones as tokens with your favorite board games. Vase Filler: Dress up a floral arrangement by adding color-coordinated stones to a clear vase. The arrangement will stay in place better, and the stones add weight to the bottom so the vase won't tip over as easily. Home Decor: Tumbled stones can be a lovely accent for picture frames, candle holders, centerpieces, and many other home decor items. Many people like to use tumbled stones when they are practicing mindfulness, meditation, and spiritual healing techniques. Chakra stones: Chakras are "spiritual centers" of the body. Commonly used chakra stones include: amethyst (crown chakra), sodalite (brow chakra), blue lace agate (throat chakra), green aventurine (heart chakra), citrine (solar plexus chakra), carnelian (sacral chakra), and red jasper (root chakra). Image copyright iStockphoto / Artecke. A large percentage of the world's tumbled stone production is sold in spa, massage, alternative medicine and New Age markets. Here their uses include: "healing crystals," "chakra stones," "energy stones," and "massage stones." In some types of alternative medicine, stones are placed on the body at points of discomfort or on "spiritual centers" known as "chakras." Some people report relief from these treatments, although traditional medical research has not proven that any cure or healing occurs beyond a placebo effect. The treatments themselves are usually not harmful. However, some people use them instead of seeking genuine medical care as a serious medical condition progresses. Dyed tumbled stones: These stones have been dyed to impart vivid colors. 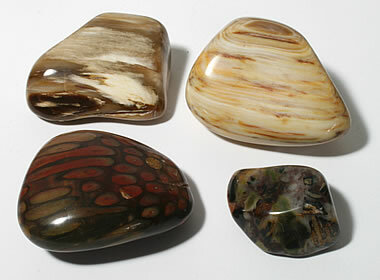 Clockwise from top left: Banded agate, agate, howlite, granite, feldspar, and dalmatian stone. Enlarge image. Many manufacturers treat tumbled stones with heat, dye, oil, or wax. These treatments can improve the appearance and marketability of the stones. Heat and dye can change the color of a stone. Oil and wax can conceal fractures, hide a bad polishing job, or make a smooth rough stone look like it has been polished. Dying is possible because many tumbled stone materials are porous. This allows colored dye solutions to enter the stone and impart a bright color. 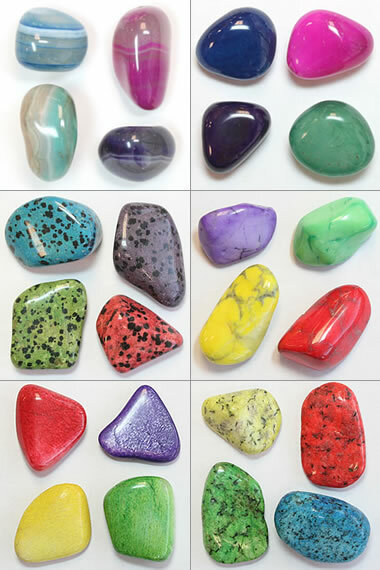 Brightly colored stones are often easier to sell and many people like them. Dye is usually used on light-colored, inexpensive, noncommercial stones that can be tumbled in a short amount of time. These include: magnesite, diorite, granite, feldspar, and agate. Dyed stones are often not colorfast. Some will lose their color with prolonged exposure to sunlight. Water-soluble dyes can transfer from a stone into water or onto hands, clothes, or other objects. Dyed stones usually fade if they are placed outdoors in exposed locations. Vendors who sell dyed stones should inform buyers to prevent disappointment. 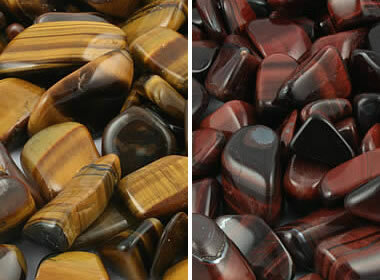 Gold and red tiger's-eye: Gold tiger's-eye is sometimes heated to create red tiger's-eye. This heating can also occur naturally in the rock unit. Many materials will change color upon heating. Gold tiger's-eye can turn red with heating. Amethyst can turn yellow, orange, gold, brown, or green with heating. These stones are then often sold as "citrine" or "prasiolite." Vendors who sell these stones should disclose the treatment because the "commercial identity" has changed. 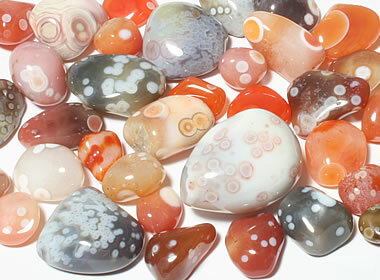 Some light-colored agates will turn brown or orange with heating, or black if they are first soaked in a sugar solution. These are sometimes sold as "carnelian," "onyx," or "black chalcedony." These heat treatments are permanent, but buyers should be informed because the "commercial identity" of the stone has changed. The heating process can also occur naturally. Agate, tiger's-eye, and amethyst are materials that sometimes form in volcanic landscapes. They can be heated if the rock units that contain them are overrun by a lava flow or if a magma body intrudes above or below. The altered identity of these stones is considered to be "natural." Waxed river stones: These stones were rounded and smoothed naturally by river water. People in China collected these stones and treated their surface with wax to make them look smooth and shiny. 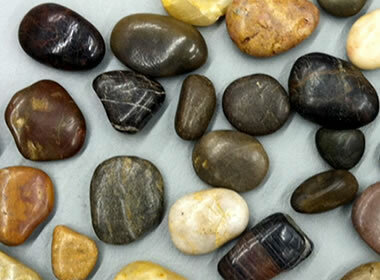 They were then marketed as "polished river stones" by a major retailer in the United States. Although many people would consider "waxing" the stones to be a "polishing," people who work in the lapidary industry would object because the wax only gave these stones the appearance of being polished. Waxing and a lapidary polishing would both be treatments to these stones - but they have different meanings to different people, and to some people the method is just as important as the outcome. Some tumbled stones are waxed or oiled to give them a shiny appearance. Wax and oil can fill fractures or surface irregularities and give the stones a brighter luster. Wax or oil are sometimes applied to common river or beach stones to make them look like they have been polished. Waxes and oils usually wear off over time with handling or exposure to water, soap, or sunlight. These treatments are not permanent and should be disclosed by the vendor. The word "polished" can be used in multiple ways. One definition would be: "something has been done to make the surface of a stone smooth and shiny." Another definition would be: "something has been done to make the surface of a stone look smooth and shiny." Both of these would likely satisfy a dictionary definition of the word "polished." But there is a subtle difference that would be significant in the minds of some people. In jewelry and lapidary terms, only the first definition is a "genuine polish." The surface of the stone has been worked with sufficient care and skill to give it a smooth and shiny surface. A person who works hard to "polish" stones this way might strongly object to seeing oiled or waxed stones marketed as "polished stones." However, these oiled and waxed stones might meet the dictionary definition of the word "polished."